…and I’ve gotta say, I’m really enjoying the whole two-story thing too. I grew up in a two-story farmhouse in Minnesota, and being up higher than some of the trees around this place definitely brings me right back to that time. At the top of the second landing, you can either go to the left, or go straight. 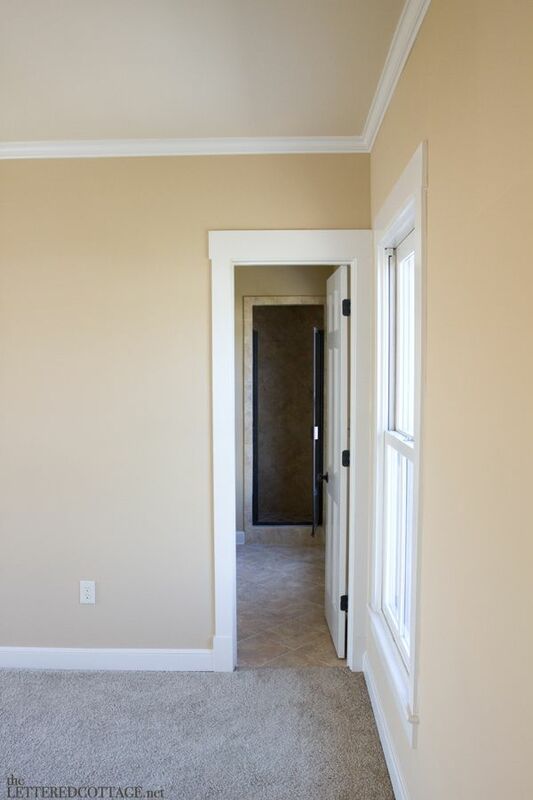 The door to the master bedroom is at the beginning of the long hallway. Once you walk through the door, there’s a closet for our washer and dryer on the left, and then our walk-in closet is on the left after that. The master bedroom is nice and big, and because there are windows on three sides of it, it’s filled with natural light from sun up to sun down. Yay! Thank you for letting me sleep on that side, Mr. Palmer. 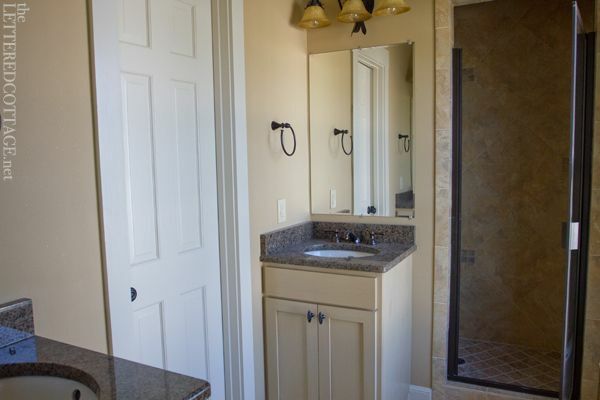 The master bathroom is….interesting. We’re assuming it was one of the reasons nobody bought the house all these years. We’ll have to make it work for now, but in the future, we’d like to add on a master bedroom/bathroom, laundry room, and a kids room downstairs- on the back side of the house. Then we’ll use the two rooms upstairs as offices, and do something different with the bathroom(s) up there too. Maybe just pull out one of the vanities in this bathroom and install a tall storage cabinet in its place instead? 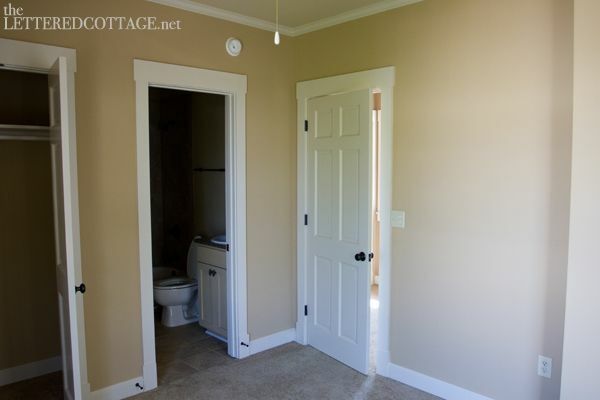 Maybe reconfigure the two bathrooms completely, so that there’s only one bathroom that leads off the hallway? Beautiful home! And, from what you have written, it sounds like a wonderful place to raise a family. So happy for the both of you. 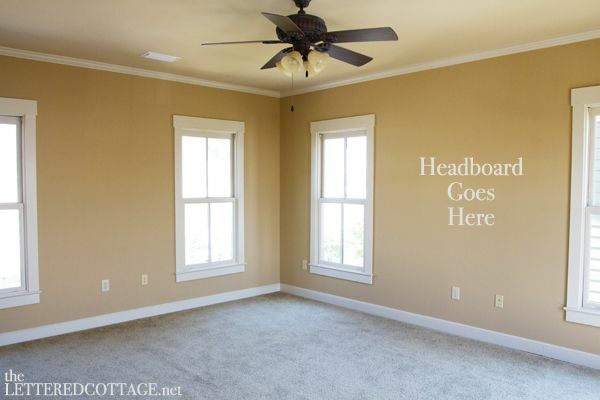 Look forward to seeing what you do with your new house. Blessings to you. Thank you for taking us on the tour. What were they thinking, master bath? I know you will make it adorable and functional. Your home is beautiful and Kit-Cat is loving it. . Enjoy seeing the happy pictures :). Gosh, what beautiful views! I’m so happy for you and Kev.. Awesome! Thanks for sharing! I love it all and the potential that I know you guys will “Cottage” up a bit. I like your positive attitude about little one coming into your family! Love it. It is very cute. I will be anxious to see all the ideas come to life. Thank you so much for taking the time to show us your new home. Very very excited to see all your Layla and Kev touches. 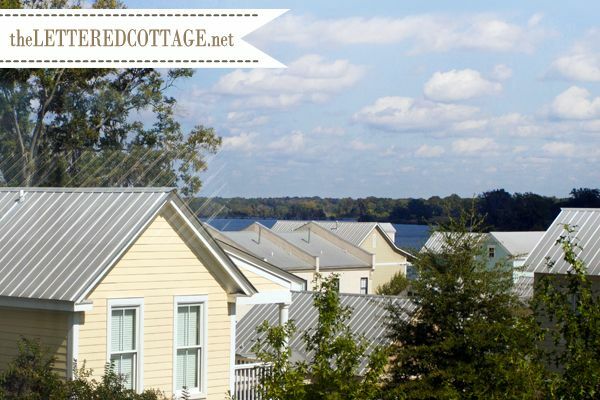 My parents have a metal roof (don’t see a ton in Michigan…to exspensive) but I would have one if I could. They ARE truly beautiful!!! Can’t wait to see more pics:) Happy Weekend!!! Your new home will be a wonderful place to start a family! Four of my seven grandkids are adopted and I’m feeling warm fuzzies for you, too. A couple that can give such a good home to poor, injured, stray Kitty Kat will be marvellous parents! This is surely, CHRISTMAS IN OCTOBER! For you, Kev and all of us. Love the house. Love the feel of it. Are you going to “sage” it????????? Kit-Cat’s little face says it all. Welcome to your new house, Layla and Kevin I am happily anticipating watching you make it your home. Love the fur kids exploring …they make terrific tour guides. P.S. Did Kev cry when he had to leave his brand-new office? lol I would’ve tried to tear out those gorgeous closets & take them with me! Hope your shy carpenter is still close enough to come build you some more! Hope we get to see some of these shots Kev’s working on! Ok, people are getting all worked up over a……bathroom? It’s a BATHROOM, the least important room in the house, lol! As long as there is a place to do the business and wash your hands…that’s all you need! The reason that house never sold hasn’t a thing to do with the bathroom…it was waiting for you and Kevin and your family. Oh well. We’ll fix ‘er up sooner or later! Hey guys love the new digs! 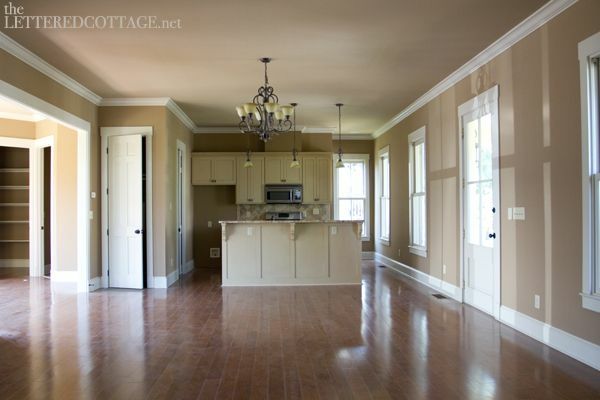 I’m sooo excited for this house bc I live in a newer home that my husband and I had built. This was before I discovered all these wonderful blogs and found out what my decorating style is. Now there are many, many things I would change…oh well. =0) All it takes is a little time and patience. But I can’t wait to see what ya’ll do to your new house!! We love that the house *looks* like an old house, but *feels* like a new house and that’s there’s lots of room to add cottage charm! Beautiful! Even with the kind odd bathroom, its amazing that no one snatched it up! It was waiting for you guys! I know this isnt Facebook, but I’m sending the thumbs up! I also grew up in Minnesota and am very familiar with those two-story farmhouses you’re talking about. My dad grew up in a small farming town and I have so many happy memories of farmhouse family gatherings. Can’t wait to watch your progress! Wow, I am jealous of the view. Weird bathroom layout, but at least it is done. I have a 1950’s bath to re-do! Hopefully we start soon. Whew! I can’t wait to see what you two do with this house. Although many people would look at this and say “that’s a really pretty house” – as is – to me all I see is “builder basic.” I know you two will up the charm factor exponentially and make it a true home. Have fun! 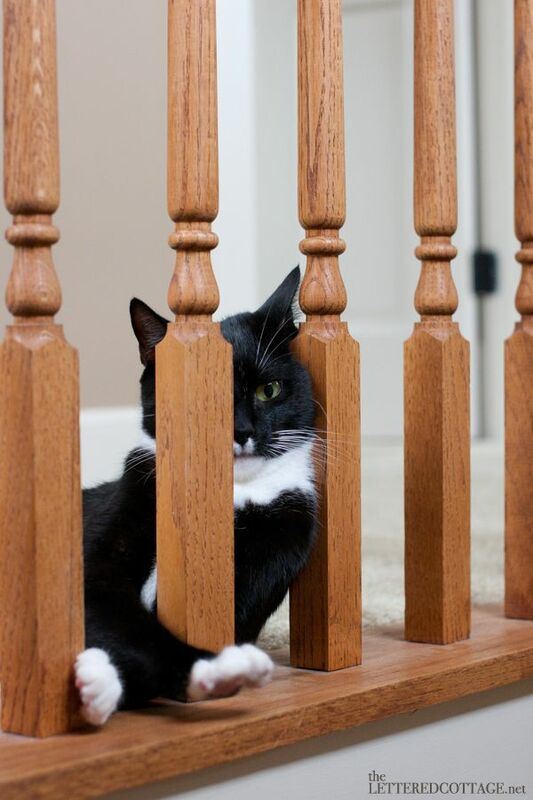 Hmmm…I think Kit-Cat wants to paint the stair railing white..
Loving the tour of your new home, Layla, and can’t wait to see the changes you make. No pressure… you have time. =) I grew up in a two story farmhouse in (central) MN as well. I still find that two story homes are my preference. Can I ask where in Minnesota you grew up (or region if you don’t want to say specifically)? It’s funny because if I could see myself living in another state, it would be AL. My husband makes yearly business trips down there and sometimes our kids and I get to go along too. We’ll be heading down in a couple of weeks. It’s my home away from home! 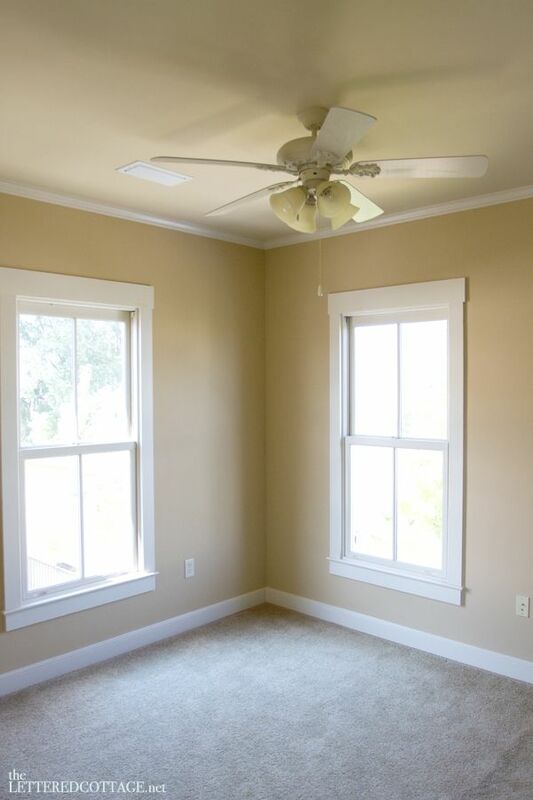 Love all the windows and natural light in the master bedroom! That bathroom is so weird though! Why in the world would they put 2 small vanities in there? I’m so behind in saying a huge congratulations on your new home! It seems like everything came together so well and your new house is just beautiful. I know the two of you will turn it into a charming, gorgeous home. I smiled when I read your two story comment… I never lived in a two-story house until a couple years ago when we bought our old farmhouse… but always wanted one from the time I was just a little girl. 🙂 Have a wonderful weekend! Looks nice! 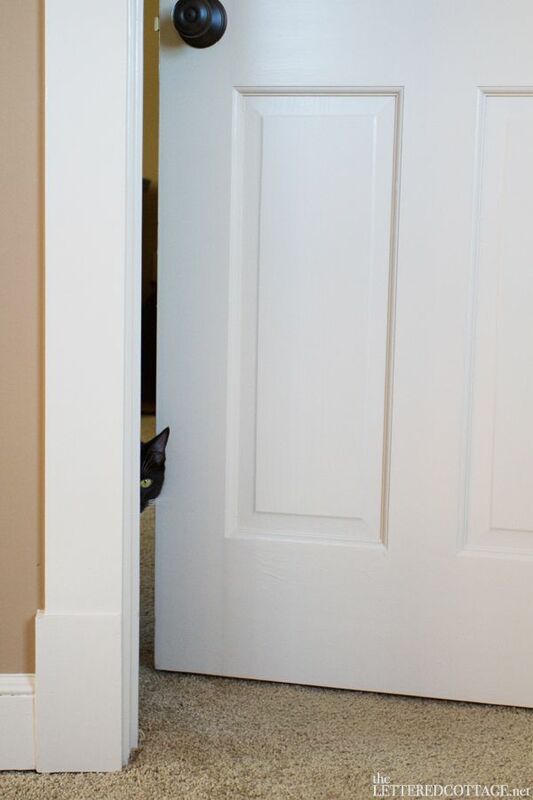 I”m looking forward to your posts on renovating the bath room. It’s an odd layout and bathrooms are supposedly the hardest to change. Good luck girly! I love the new house and can’t wait to see what you do with it! We are currently in the market and as I’ve come across newer built homes, I’ve thought, “Nah, it’s too fancy for us.” I would have felt bad about going in and replacing things that were so new. Of course, you can always sell them on craigslist! Best wishes to you guys. And get on it would ya so I can have some new inspiration! Our thoughts exactly, Julie! We’ll definitely donate whatever we remove to Habitat for Humanity, or sell it on eBay. Love Love Love it Layla I look forward to seeing all your styling you are both so talented. I am curios to see how you “cottage that up”. It’s so typical “builders beige”. It really is beautiful the way it is but I know you will change it up and I”ll learn a lot watching what you do. You’re so sure of yourself and you both seem fearless. Where will you start? I love your house! It is precious and beautiful! I personnally like all the finishes, except carpet, I’m a hardwood lover. But the carpet you have looks so plush and pretty. I even love the masterbath, cozy yet there’s privacy with the toilet room secluded with a door. And all the framed windows! Oh my! It’s so light and bright! I Love it! I love your design and can’t wait to see how you decorate your home. It’s so lovely! Our cat’s look so much a like it’s SCARY! Our girl is Raja. I am so thrilled with your new home. That neighborhood, that view, the lake so close, all the other beautiful homes and a beautiful boned new home. Which you guys would only be truly happy putting your personal stamp on. Your clean, sophisticated style and wonderful use of color, space and balance is the reason so many of us are constantly inspired. Besides the fact that you are both a beautiful, devoted and faith filled loving couple who go through the same ups and downs we all do. This always makes you seem the neighbors you pray for next door. ( sorry know grammar and punctuation off there:). Happy wonderful times are coming. My husband ended up doing our nursery all by himself as I was hospitalized from 4th month on so there is special meaning in every drop of work. ( he did a whole of sawing, mite ring, hammering( anything he could be aggressive with) worked his tension out in that beautiful little boys room. I wish you both the best. What an amazing place. Can not wait to see y’all work your magic….especially on a new house this time! The possibilities seem endless!!!! What a beautiful place. With all that space from where you were standing to the actual kitchen, I’m surprised that the kitchen itself is so small. I’m often surprised by house layouts though. We’re currently looking after our neighbors cat, and being in her house brings back memories of the first house that hubby and I owned. It was a split level (same layout and builder as hers actually), and we had turned part of the basement into our master bedroom. 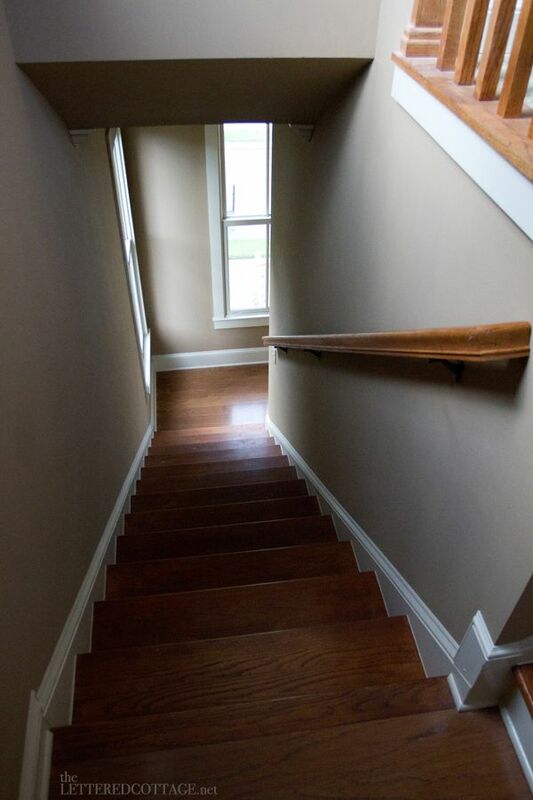 Besides the vaulted ceilings, the silliest thing I miss are the stairs. I miss having stairs in my house for some reason. 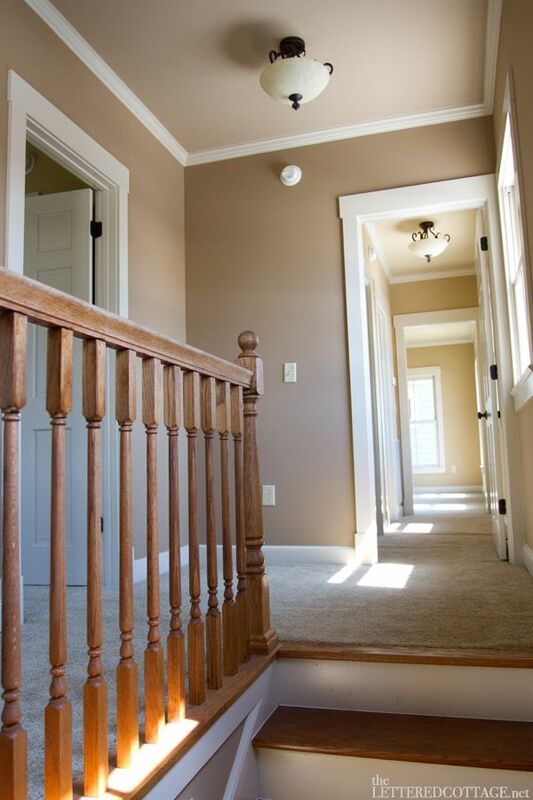 Something tells me those orangey oak balusters won’t be orangey for long. I can definitely see the potential, you guys are going to do amazing things here. Jealous of the lake nearby too! 🙂 Congrats on everything working out just how you hoped! Thanks for sharing a tour of your new home with us. I can’t wait to see what you do with it, but for now it is already a really wonderful home. Blessings in you new diggs! Love all your plans and ideas. That view is awesome! I don’t know why but when I saw that view and I saw the porches in your other post, I keep picturing Seaside, a community that I’ve always loved, though I’ve never been there. Just love looking across all those pretty roofs with the lake beyond. I’m sooo happy for you guys! I LOVE the outside of your new house! How lucky to have a BLANK CANVAS inside. I know after much thought and a little time…you will have the inside looking UNBELIEVEABLE! I can’t wait to see pictures! Good for you!!! 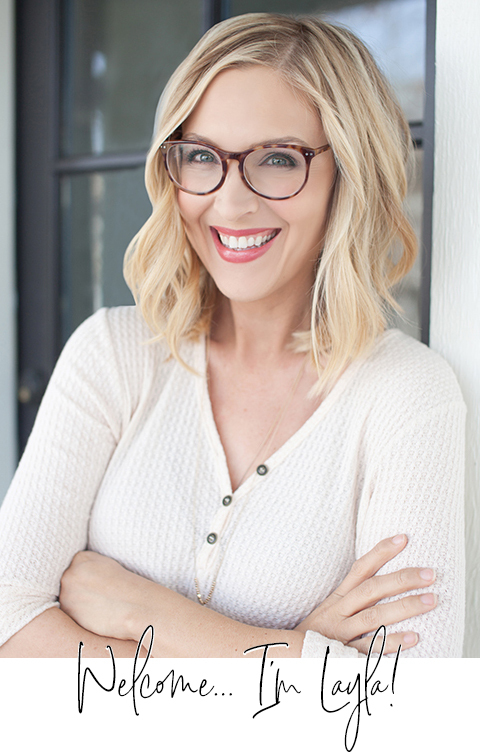 My name is Susan Henderson and I’m the architect that designed your house many years ago. I was given a size limitation and the program for bedrooms and baths, and there you go. But there is a master bedroom addition for the rear of the house that I can send you if you’re interested. No cost to you, the developer paid for it. My firm, PlaceMakers, designed The Waters original master plan, so I’ve been involved with it for quite awhile although not since the new owners have been in place. Please let me know if you’d like a PDF of the downstairs master. We actually got that plan from Andrew shortly after we moved in, and we’re excited to customize and make it happen at some point in the future! I have only recently discovered ur blog, and this is the first time I’ve had a chance to check out anything more than ur recent posts. I love your new home. The house and neighborhood are delightful. I wish you the best of luck with all of your projects and look forward to reading about them. I adore the photos of Kit Cat…children and pets help make a house a home. From the sounds, you will be fulfilling the other half of that soon. The house really looks like a great place for a child to grow up. God bless you, your family and your new home.